We’ve seen this one before. If Smith leaves any doubt about what’s going on here in his video message, (I mean, he could be a Truman-esque patriot merely seeking to make government work better for all citizens, right? Right? ), the text on Cantor’s site to GOP supporters removes that mite of ambiguity. In the “Search Award For” field, try some keywords, such as: success, culture, media, games, social norm, lawyers, museum, leisure, stimulus, etc. to bring up grants. I guess I gotta fess up here. If this witch hunt is retrospective, I’m in trouble. My last NSF-funded project featured a collaboration with the Pacific Science Center in Seattle, which (as the proposal detailed) formed a network of science museums to help folks grasp ideas about the making of knowledge about phenomena removed from us by distance of space and/or time. So if they come for any of us, I guess they may come for me. Seriously though, this is thought-police stuff. Smith concedes that there is good science — physics, chemistry, the hard stuff — or rather, in this climate, the safe kind … for now. But of course nothing is safe. Cosmology gives us insight into deep time, godless origins, and, more corrosive than any other thought, the realization that humankind does not occupy a privileged place in the universe. That’s obviously not on. And so on. When you get down to it, it’s not the funky, more-than-an-elevator-pitch-to-explain research that’s the problem. It is, rather, that you can apply reason and formal methods to elicit facts from the material circumstances of our existence that puts the sand in the vaseline down at GOP HQ. Independent authority is unacceptable. I’m going to go somewhere a bit dangerous here. Godwinizing is a touchy game, and calling examples down from between-the-wars-Germany down on someone named Cantor risks a predictable response. But hell, I answer to Levenson so I’ll take the plunge. In 1920, just as he reached the first full rush of his fame, Albert Einstein attended a public meeting of the Arbeitgemeinshaft deutcher Naturforsher zur Erhaltung reiner Wissenshaft — the Working Group of German Scientists for the Preservation of Pure Science . As he sat, silent, in the audience, he heard speaker after speaker denounce relativity as hostile to true Germans and true scientists. The controversy did not end there. Later in 1920, the autumn meeting of the Society of Society of German Scientists and Physicians pitted Einstein against Philip Lenard, a Nobel laureate whose work, ironically, had led to Einstein’s early breakthrough on the quantum theory of light. That is, relativity being counter-intuitive, ought to be false. It would be more comfortable if it were not true, less troubling to the soul. Lenard’s justification for this claim went like this: step one: Einstein’s science made no sense. Step two: therefore, it had to have been produced out of a malign desire to undermine the clarity of science and the certainty of its conclusions. Finally, the ultimate step in this catechism, Einstein’s evil impulse here was born of the inherent Jewishness of relativity’s author. And how did the Nazi preference for allegiance and national origin over scientific competence work out for them? Not so well, thankfully, as we know. Leap now from 1922 to 2010: are Smith and Cantor denouncing particular research grants because of the ethnic or religious affiliation of the researchers? Are they setting up the conditions in which the question of whether or not a given piece of research is “American” enough? A last note, just to make myself clear: I don’t think that this latest witch hunt is (yet) a direct threat to people interested in inappropriate ideas. It does make us dumber, day by day. Pace every invocation of American exceptionalism, there is no particular reason, as readers of this blog know better than most, that the US of A will remain the undisputed king of all disciplines forever. There is some uncertainty, however, about how fast our competition will arrive, and how likely it will be that we slip beneath the top rank of scientific and technologically innovative national leaders. And there, the answer is — if Smith and Cantor have their way — sooner and more grievously than we think. *The Einstein/”German physics” material is slightly edited from one of my earlier, published works. No link-mongering here. If you are interested in more, dig for it. 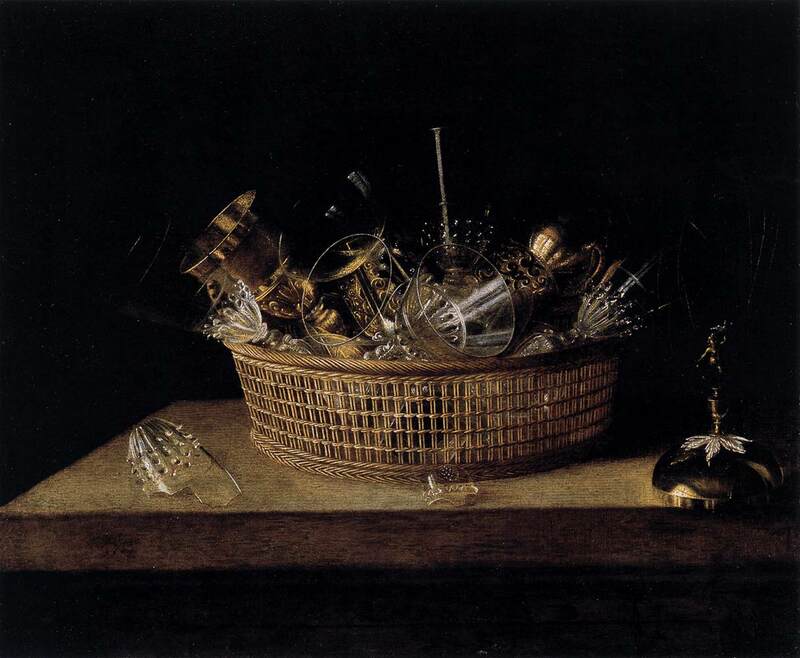 Images: Sebastian Stoskopff Still-Life of Glasses in a Basket,” 1644. 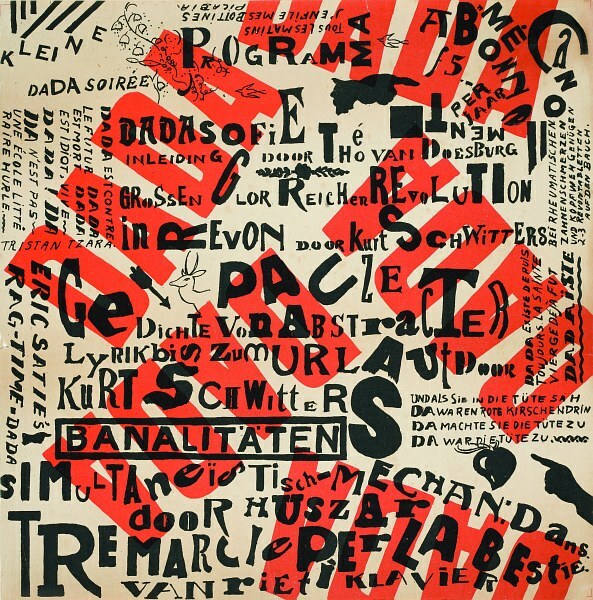 Theo van Doesburg, Poster Small Dada Soiree, 1922. Categories: Republican knavery, Science Policy, Stupidity, Who needs science?